Very nice storytelling, animation, and characters. I braced myself for a torrent of tears, only to find out my tissue box served no purpose. The story does touch me, but not in a way that makes me absolutely heartbroken. This type of tragedy didn't exactly "connect" with me, but it might with you. It's totally worth the hype, so do yourself a favor and watch it right now!! I was recommended to this movie from a comment on a romance anime here on crunchyroll. I watched the entirety of this movie, and its ending left me disappointed. I couldn't find happiness or satisfaction anywhere in part 2 or 3 where part 1 had set my hopes up. This movie made me more frustrated than entertained. I know a lot of people here like the movie for its unique storytelling and harsh reality, and I felt as if I should have enjoyed it under different expectations, but not when I'm on a romance anime spree and I'm always expecting a satisfying ending where either the main characters finally hook up or justice has been dealt (e.g. School Days). I was disappointed to see that I can't watch this movie in Canada. I was really excited cuz I heard good things but now gotta go find it on some random website. I'm not basing ths off of the movie itself, heard it was very good... just upset because it's not available for me to watch even though I pay for premium. There is much to be said about how 5 Centimeters per Second makes one feel. At the time I probably cried more tears than needed, but I do not regret watching it at that age. This movie isn't afraid to show the truth about long distance relationships that many audience members would like to not face. Sometimes things die slowly and that's okay. I just feel empty now. The movie/episodes pulled at every single emotion and kept pulling until all that was left was the cold and sad realization that the ending brought about. The movie had some fairly heartwarming beginning and really made the viewer think that this show was going to be a nice and amazing Shoujo romance. The characters were full of emotions and felt very human which played to the sadness. Altogether, the movie/episodes really felt real and made me entranced with feelings of emotions that are not fairly as common in anime. It's endearing, and you get the sense the film will progress in some direction. Episode one follows the cutesy traditional childhood friend schtick with a long distance twist. It's fun in it's own way. It's cute. Episode two is.. some new character being infatuated with a protagonist. Okay, that's fine. Not totally uninteresting, but not really interesting either. No progress is made in any direction. A girl realizes a boy loves someone or something else. Rockets go 5 km per second. Fascinating. Unique. I've watched a harem anime before, I get it. Episode three. I was waiting for this. But guess what. Nope. Nothing. Just both characters from episode one having trouble being adults. Getting edgy about their childhood friend they decided not to talk to anymore. Cool. Hey, you know you guys had each others emails and home addresses after that goofy kiss? No? ok. well, nothing f***king happens. It'd even be better if she cucked him. Just have something happen, or what was the point of the last hour and a half of my life? I don't care about either protagonists at this point. They're both immature for avoiding one another and then blaming their emotional state on that absence. If you're looking for a compelling story and characters with which you can identify, look elsewhere. The three parts all feel very disjointed when put together. The tone is all over the place, and the absence of a strong overarching narrative leaves the story feeling empty. Things just sort of happen, and then it ends. While some of the situations and emotions expressed are certainly relatable, you're left so disconnected from the characters by the strange pacing and jarring swaps of pov, that in the end you don't feel anything for them. 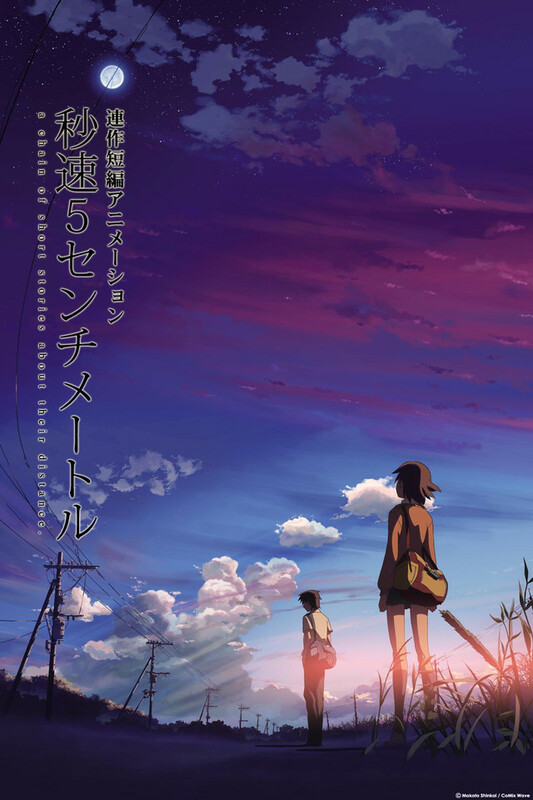 Finally watched 5 centimeters per second. I somewhat understand the hype now. It's not in the story but the presentation. The art, the music, everything was in perfect sync. I loved how they delivered the emotions of the main character. I couldn't understand them all but I felt them anyway. I really want to know exactly what went down and how they fell apart. How something so beautiful could break. What exactly did time do to them? I am interested in all that but I guess I will never know. It was good, but not as good as the hype for me. I think the problem is that I am in my mid-twenties and married, so I already experienced all these problems and long since accepted them. This movie would have probably hit me harder back when I was single and alone.